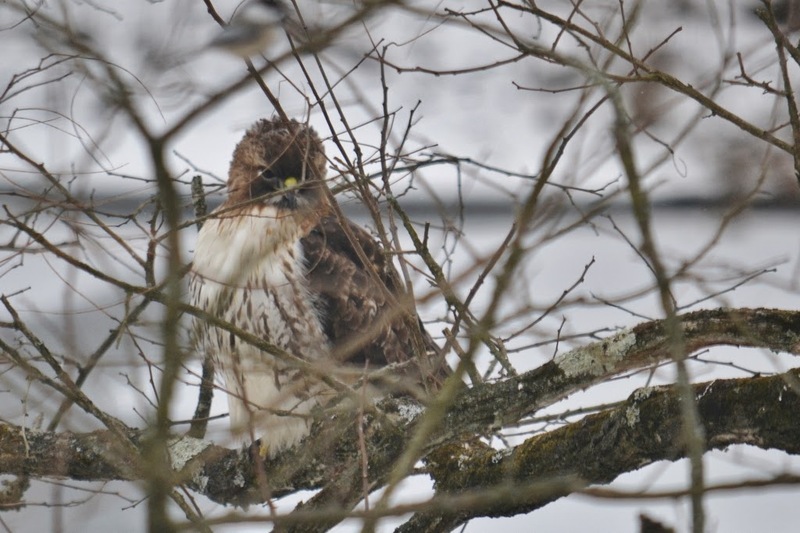 Can you guess what this Red-tailed Hawk was intently watching? Clue: look above his head in the blurry foreground to see what else was in the vicinity. Yes, this Red-tailed Hawk came to our bird feeder. He sat a few feet away from the feeder and jealously watched the other birds feed on sunflower seeds. I was amazed that the other birds continued to feed at the bird feeder despite having this raptor as company. I wonder what would have happened if I hadn't accidentally scared the hawk away when I slid open the window to try to get a better photo.... perhaps we would have seen the hawk hovering at the feeder to investigate what the attraction was for all the other birds.